Do you have a favourite cosmetic product that you love so much, but hardly ever use because you don't want it to finish? For me MAC Impassioned lipstick is that product. It took me forever to actually find this lipstick in Australia because I could never get a straight answer at the counters. I got told it was discontinued (it's not), it's LE (it's not), it's not sold in Australia (not true). The real answer was that it's a Pro colour and only sold at Pro stores or online at the MAC website. After finally tracking it down, I was and still am extremely impressed with the colour. It's a watermelon pink that just brightens the face and instantly makes you look glammed up no matter what other makeup you have on. Even though normally I love hitting pan or using up make up (then I don't feel guilty about the amount I own!) with this lipstick I worry about using it up and not being able to find a replacement, hence I don't wear it that often. I've written about it quite a lot in the past, so click HERE and HERE if you'd like to see some previous posts about this lipstick. What is your one favourite makeup that you don't want to use up? I know what you mean! I have a lot of high end lipsticks and polish that I don't reach for because I don't want to "waste" it! But I have vowed to start using them up because it actually IS wasting by just sitting there in my makeup stash. You pull of impassioned quite well, Ive tried it so many times and I can't get over how bright it looks on me! You wear it well! That lipstick is beautiful! I have a philosophy hair oil that I found at a TJ Maxx awhile ago and I'm pretty sure it's been discontinued. It makes my hair shiny and feel so healthy the entire day I use it. The directions say use it once a week but I usually do it 2x month or only on special occasions because I'm hoarding it. I love that colour but not entirely sure i can pull it off. I have been guilty of 'not using so it doesn't run out' hoarding on many occasions - usually it is with a Lush discon or LE. I think, oh no - too precious to use...but then if it is just sitting there, not being used it is really no different to not owning the item in the first place. Another item I have done that with is La Prairie's cavier pearls. My sis brought it back from switzerland for me so I only use it a couple of tiems a year because it is so precious...though it is probably well and truly past its used by date becuase i didnt use it regularly like I should have. I have found that often with LE items that I think I can't live without, by the time I eventually use them up I have discovered another 10 products that I love just as much so it doesnt end up leaving as big a hole in my life as i first imagined! I know the feeling! That is the way I feel about my NARS blushes, especially exhibit A.
I totally get what you mean though, I can never bring myself to use anything that was limited edition - it's like, I can never get it replaced so I avoid using it. That's such a shame. In the US, where I purchased mine it was a permanent item sold at all counters. And only $14.50 opposed to $36 here. hahah I hear ya I have a few lipsticks myself that I think is to pretty to use up && its not as easy to find. It's absolutely STUNNING on you Lilit!!! I don't think it looks better on anyone else! And I think next time I wear it, I will try to do my make up like yours... I have woodwinked and a similar blush. I feel the same way about my limited edition lipsticks, I'm so scared they will never be re promoted! Mercedes - thanks hun, it is definitely bright but especially summertime I think it looks wearable. I need to find a dupe! Pink Glitter - just checked out your post on it, I've never heard of that hair oil. Must really be a miracle product if you don't want to use it up. I feel for you! Georgia - it's only in Australia that it's a pro shade, as in other department MAC counters it's not sold at all. Sarah - Totally understand what you mean, because hoarding it is so much more wasteful. Especially now that I blog and buy a lot more products, new favourites come up all the time so I don't know why I worry about using up precious makeup. Pretty Me Purple - yes it is, I've got it on in the profile pic. Damn LE colours, making us paranoid about using them up. Joyce - they're just sold at Pro stores so it's not too bad. I just don't have a pro store near me that's all. Whosoloves - don't get me started on the US vs AUS prices. I'm feeling ripped off with every MAC purchase I make. Jenn - the bad thing is after a few years lipsticks develop a weird smell and you have to chuck them, so such a waste! Laiqah - oh babe but you wear it sooo soo well too, I love it on you! In fact when I saw your post on it a few days ago that's why I was reminded to take it out of hiding! Joelyne - thank you so much, xo. Lovely shade. You are rocking it. beautiful shade, i think i saw that at the myer store near my place? anyway, i used to be like that with my Hourglass Primer .. didn't want to use it up but I ended up using it up anyway. a lipstick I'm loving at the moment would be MAC Morange. another product I'm worried of running out is Eyeko Fat Balm Raspberry haha.. I can't think of any lipsticks I have that I love too much to use up. I can see why you love this shade so much though! Looks great on you!! D: Aww. I've started having similar feelings towards some of my products so I know how you feel! My MAC Ravishing has really started to show some wear. Gaea - they're sold at Crushcosmetics.com.au as far as I know. London is so miserable right now I feel like I cant wear it. I wait for the sun.. but even then its hard to pull off in this city!! <3 it on you! Hi Ebony, here's a post where I'd compared Impassioned and Fusion pink. 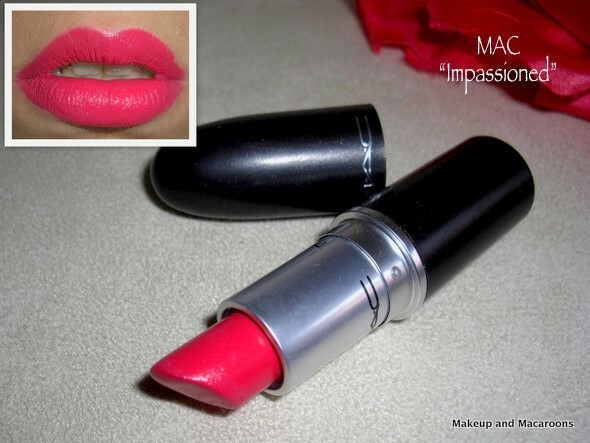 Impassioned is slightly cooler toned and more pink than Fusion Pink. And you've actually reminded me about Fusion Pink which I haven't worn yet since I swatched it! Good luck trying to decide!